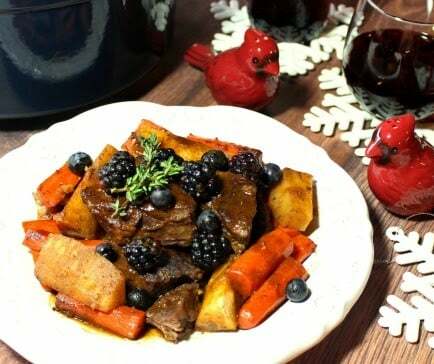 Holiday Braised Short Ribs are cooked low and slow with fruity red wine, beef stock and a bit of prepared horseradish. Their buttery tenderness will melt in your mouth, making them a totally memorable meal and one that holiday traditions are built upon. I don’t know about you, but for me when it comes to holiday decorating traditions, we do a lot of decorating with snowflakes. It’s not that we don’t get enough snow here in Illinois, (because we certainly do), it’s just that I’ve always loved their uniqueness in the thought that no two snowflakes are ever the same. Much like individual people and their own style of cooking. If you take five different people and they each make the exact same recipe, each of those completed dishes would be slightly different from the others because of the personal touch that each person would add. Even if those cooks didn’t change one thing in the recipe, they each would still have a quality that no other dish would have. They would be similar…but not exact. Just like snowflakes. 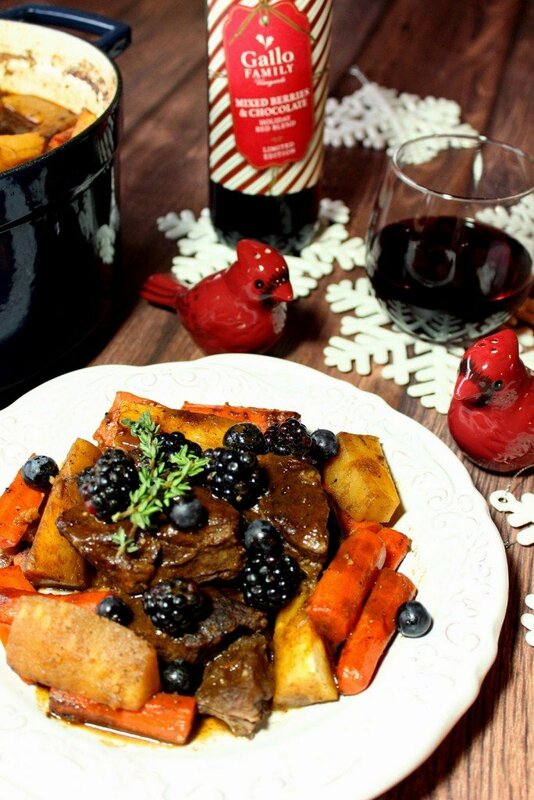 It is with that thought of personal style; the holidays, snowflakes, and cold winter weather that made me want to share with you my recipe: Holiday Braised Short Ribs for #SundaySupper. 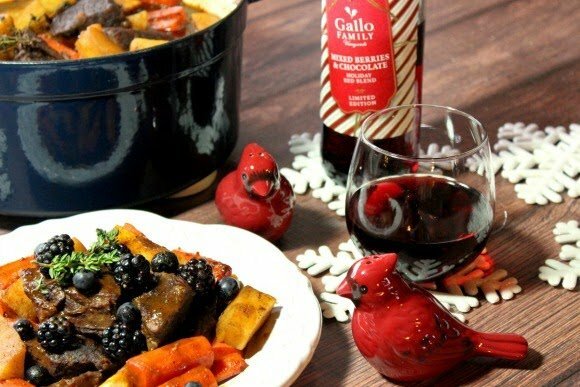 With the help of Gallo Family Vineyards and their Seasonal Holiday Blends, this dish is a perfectly memorable meal and one we’ve used as a traditional, heartwarming celebration dinner for many, many years. It’s a family favorite! What makes this particular dish a little different from other times I’ve made it is that I used Gallo Family’s new seasonal Mixed Berries and Chocolate Holiday Red Blend in addition to Gallo’s Cabernet Sauvignon, which I’ve only used in the past. The flavor that this new holiday blend gave the short ribs is a light touch of sweetness and a mild hint of chocolate that is a nice contrast and compliment to the richness of the beef. 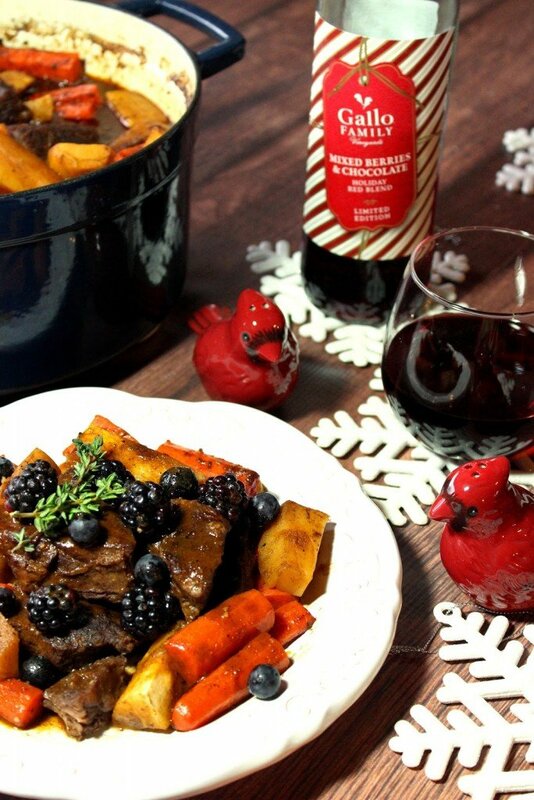 *Note – If you’re making this dish when the Holiday Red Blend is not available, please substitute Cabernet Sauvignon for the same amount of the seasonal red. -Working in batches, brown the seasoned short ribs over medium/high heat in the reserved bacon grease on all sides. Remove to a platter and keep warm. -When all of the beef has been browned and removed from the pan, reduce the heat to medium. Stir in the tomato paste, onion, celery and garlic. Cook and stir for 2-3 minutes until the vegetables have softened and the tomato paste to developed in flavor. -Stir in the wines, beef stock, prepared horseradish, and bacon making sure to scrape up the browned bits from the bottom of the pot, and then nestle the browned ribs into the wine and stock mixture. -Add in the thyme sprigs and bay leaves, along with 1 teaspoon salt and 1/2 teaspoon pepper. -Cover the pot and either simmer on the stovetop on very low heat for 4 hours OR place the covered Dutch oven in a preheated 325-degree oven for 4 hours. -After 4 hours, add the parsnips and carrots into the pot along with the remaining 1 teaspoon salt and 1/2 teaspoon pepper. Cover the pot again and continue cooking for an additional hour until the meat is fall-apart tender and the vegetables are cooked through. -Use a slotted spoon to remove the meat and vegetables from the pot. Keep warm. -Remove the bay leaves and thyme sprigs. Stir in the butter. -Serve the short ribs over your choice of potatoes, rice or noodles and top with the wine sauce. -If desired, garnish with fresh berries and a thyme sprig. We loved the flavor of The Gallo Family’s Mixed Berries with Chocolate Holiday Red Blend in the short rib recipe as well as a delicious accompaniment to our meal. They complimented each other very nicely. If you’re also wondering about Gallo’s white holiday blend, then you must check out their seasonal Apple and Caramel Holiday White Blend. It’s has a creamy, crisp and fruity taste that would be a perfect accompaniment to a nice slice of pie after dinner or by itself as you’re waiting for dinner to cook. For additional information about Gallo Family Vineyard wines, please follow them on Facebook, Twitter, Instagram, and Youtube. Click HERE to find a store in your area that carries the many delicious wines and varietals that Gallo Family Vineyards has to offer. Click HERE for a $1.00 off coupon on your next purchase of Gallo Family Wine. What a terrific dish for the busy holiday season! I bet the Gallo wine adds some amazing flavor…and can only imagine the tempting aromas from your kitchen! I saw a pack of short ribs in the store the other day and was pretty sure I would go back and get some after seeing your recipe. Yep, they are on my shopping list now. Yum! What a great dish! I love that you added blackberries to it! It's perfect! I have yet to decorate, but something tells me that if these short ribs were simmering in the kitchen, I'd hop right to it! It's true, Renee. When I was in culinary school, three teams would be assigned the same dish. Same exact recipe, and then we'd taste it. It was amazing how different each dish could be! Short ribs are a seasonal favorite of my husbands – I love the addition of the horseradish! Wow! Braised shrot ribs are a family favorite and your recipe is a keeper. Look at how you paired the mixed berry wine with the fresh berry garnish…genius! We are a little behind in our decorating this year. I need to make up a batch of these delicious short ribs and light a fire under me to get it done!! Beef Short Ribs are the most amazing beef meal ever! They are always melt in your mouth perfection and so flavorful! This dish sounds fantastic! Renee-thank you so much for sharing this fantastic recipe-love the combination of flavors. 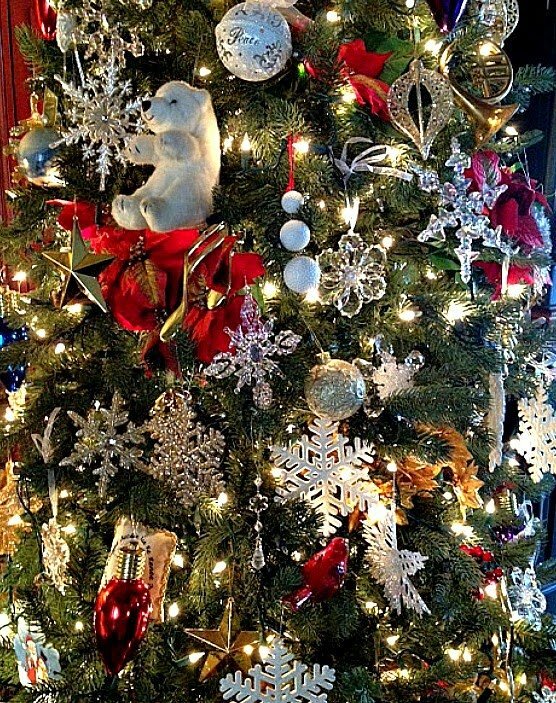 I love your gorgeous decorations! I love your comparison of cooks, meals and snowflakes! This ribs sound perfect for a cold, wintery meal! Braised short ribs are one of my all-time favorite comfort foods! These look so delicious! Mmmmmm…holiday comfort food at its finest, Renee. The addition of berries is very unexpected, but I bet that holiday wine ties them right in. Wish I could reach in and grab a plate! My hubby is quite the fan of short ribs and these look really good! Love braising short ribs! Looks delicious. love the fresh berry garnish…really brings the plate together. It's so true that every cook comes out with a slightly different variation, which is what makes food and eating so exciting! These braised short ribs look like the ultimate comfort food for the cold weather. I love braised short ribs! Will have to try this one! What a terrific wine flavor! Perfect for braising those short ribs!! And the berries? Oh, man!! Love, love, love this!! And I love your tree! Your house must have smelled unbelievably delicious with those short ribs simmering! What a truly unique dish…just like snowflakes! 🙂 I love decorating with them, too. My husband loves shortribs – I should make this for him! What an amazing looking meal! You did a beautiful job! Every cook has their variations…and I always love to see yours, Renee! These short ribs are delectable!! Love them for the holidays and a special dinner. I love braised short ribs! These sound so amazingly flavorful – I can imagine how wonderful they smell while they are cooking! Wow! Those wines would add so much depth to the sauce. Sounds wonderful! Short ribs are my favorite! And this recipe looks divine. I just might make this for Christmas! I love your analogy about snowflakes and recipes. So true! And this looks great. I'd love a big plate of this right now! It looks so hearty and comforting! This is the perfect Sunday hearty winter meal. Love! I was in line for the butcher at Whole Foods yesterday and all three people ahead of me bought short ribs…now I wish I had too! Looks delicious!